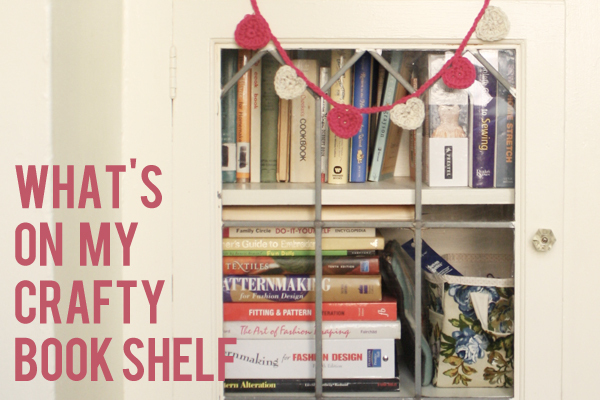 because you get to snoop inside my crafty bookshelf! it can be really nice to have a couple great craft reference books on hand. here are a few of my go to favorite books for the crafts i love to do! - this was actually one of my textbooks in college, that just goes to show you how fantastic it is! if you want to learn how to sew clothes you definitely need this book! from waistbands, to collars, to lining a suit jacket. like putting in a fly zipper or a certain kind of seam. definitely the most used book on my shelf! that actually fit you and your friends/family. and shows you how to alter your flat pattern and your garment to make it fit like it should. when i'm sewing with a friend and forget how to alter a certain area. and it's so much more fun it is to wear something that you made that actually fits right! - last of my textbooks, this is a fabulous resource for learning pattern making. pattern making is by far my favorite part of clothes sewing, so i just adore this book. it shows you step by step how to create any little fashion detail you could imagine! when i need a little inspiration or help drafting a tricky pattern. - this is a great beginner's book for learning how to sew clothes that are cute and contemporary. i got it just because i really liked the standard patterns it came with! and also goes through and shows how you can put slight variations on the included patterns. and the clothes she shows how to draft patterns for are so so cute. and then altering it to create shirts, jackets, dresses, skirts, and pants. i also just love the clean styling of this book. - this is a fairly new to me book, but i just adore it! and how to clean with a great close up picture of just about every type of fabric you can think of! i also love that it's a super cute smaller size and styled so clean and beautifully. i can tell this book is going to be very very handy when i'm out fabric shopping. - yes, i learned how to knit from a klutz book! i just loved klutz books and kits when i was a kid, and this one is so awesome i still have it on my bookshelf. but it has gotten me through so many knitting projects! and it comes with yarn and cute knitting needles, doesn't get much better than that, haha! because there is so much good stuff in it! pretty much every embroidery stitch you could think of, with nice and clear directions on how to stitch it. i don't embroider too often, but when i want to add a pretty stitch here or there, this is where i refresh my memory. - this is such a great intro to printing book! and has some really gorgeous designs and pictures. any time i do a printing project, i double check this book first. can you believe that's only my list of favorites?! i wish i had more space for them all! what are your absolute favorite craft books? which books do i need to add to my shelf? You can never go wrong with Martha Stewart. I have her Encyclopedia of Crafts and the Encyclopedia of Sewing & Fabric Crafts. I've made more things from the Craft one, but both are well-designed, easy to follow, and are full of beautiful photography. Not very exciting I know, but my favourite book would be my Singer Complete Photo Guide to Sewing. The pictures look dated, but it has every technique in it and I'm always pulling it out! I also have this book from the 70s full of macrame, crochet, batik dying...lots of cool stuff! I have most of those books, I feel cool! Something I just recently discovered is Ottobre Magazine. It's like maybe $50 or something for a year's subscription (kinda pricey), but SOO worth it. The patterns are unbeatable! They're modern and cute and super functional. You do have to be pretty familiar with sewing construction as there aren't any diagrams, just detailed descriptions, but seriously. A year will give you EVERY pattern for baby to 12 years old you'll ever need. Love! PS I love this series, and your blog!